I love my house to be nice & clean and one of the ways that I can feel my house clean it’s that it also needs to have a nice smell. That’s why I want to let you know about the 100% Pure Natural Peppermint Essential oil from Insta Natural. 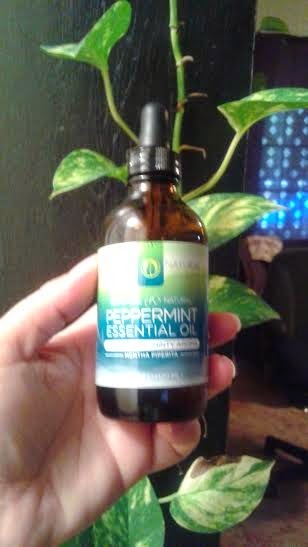 *The peppermint oil is a multi-purpose oil that cools, energizes and refreshes the body and mind. This steam distilled oil is extracted from dried or fresh leaves from the Mentha Piperita herb, giving it a sharp, menthol fragrance. Its pleasantly sweet and minty aroma makes it a premium choice for aromatherapy to improve the mind and lift the spirits. And that’s no lie. The way I used this essential oil was that I put some on a oil diffuser and let it heat up, I don’t have a electric one so I used the one that you put a candle underneith and it worked wonderfully. In one minute my house was smelling minty fresh and the aroma was wonderful. It gave me a sense of relaxation and my home felt so clean. I was not the only one that was relaxed my dog just plopped on the sofa near it and he looked so relaxed he fell asleep. I also opened all the doors to the rooms and the smell even traveled in them and made the rooms also smell good. This is a good essential oil not only for the house to smell good but for you to relax and let all the stress flow away. *I receive this product in exchange for my honest and unbiased review, regardless I only recommend products or services I use personally and believe will be good for my readers. All opinions are 100% my own. Get Long and Lean With The Pilates Studio Portable Pilates Trainer!